I hope you brought in the New Year with lots of joy and most certainly with those you love! I was home with our little one while my husband rang in the New Year with our youth – we made sure to call each other at 12 though (I missed him, but am glad he could share that moment with them). It was an extremely quiet and peaceful way to bring in 2014. I honestly spent time in prayer and prayed over our home and the upcoming year. I haven’t done that really in years past, so this was a nice change of pace for me…and much more intimate. I hope to be more intentional this year and am weirdly superstitious about starting the year off right so I did the laundry and cleaned the house before settling down. Do you do that? I figure if the house is clean maybe we can keep it up…I won’t hold my breath though, life happens. I was intrigued by seeing posts about one little word and inspired to create my own for the year. 2013 was a great year of growth and being ambitious regardless of the outcome. If I had to give it one word, it probably would have been acceptance. Learning and loving myself for where I am today and not who I wish I was or who I thought I should be at this point was really freeing and helped me move on in life. Switching my focus from what I feel I lack and what I’ve been given to embrace and allow God to continue to change and reshape is daily, but has brought a new sense of vulnerability to my stride. 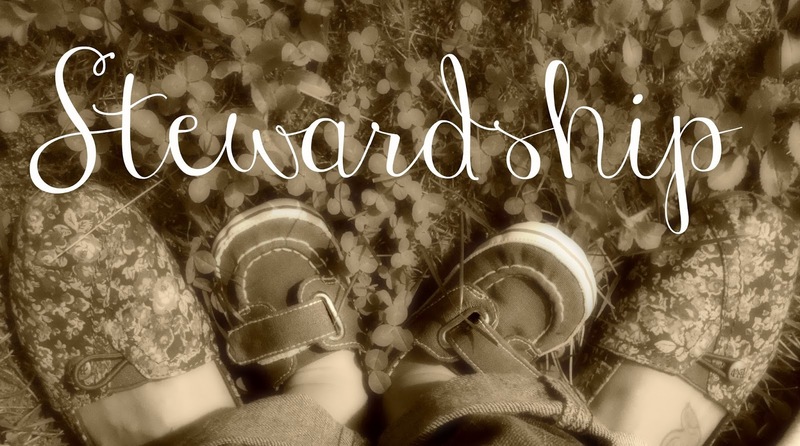 Stewardship is the conducting, supervising, or managing of something; especially : the careful and responsible management of something entrusted to one’s care. In striving for my dreams in 2013, I realized that I overlooked and sometimes just became careless at my own responsibilities in the process. Not with ill-intentions, but can’t I just be there yet? Questions frequently in my mind were Why am I not staying home yet? When is this going to happen? And my focus became so narrow that I threw my hands in the air like I just didn’t care (yes pun intended)… Which isn’t the right way to go about anything. In life I consider myself and pretty much everyone a steward. My life: body, family, possessions, job, etc are all gifts that I temporarily am responsible for. I really do cling on to the fact that we aren’t really taking any of this stuff with us…because it’s just stuff. So in being a steward I’m responsible for the success or failure, upkeep, and overall health of what I have. How I treat my husband is a part of my stewardship… if I go to work on time everyday or am consistently late is a part of my stewardship… how I advocate and protect our son is the same thing. Stewardship to me encompasses my entire life and how I treat it. It raises a standard in my personal discipline, caring about my health, investing into my relationships, and achieving the goals I set out to accomplish. Am I going to be careless? Ride through things praying and hoping for change? Or am I going to see things as they really are and my role in life… to bring the best out of any and all situations I am in regardless of how I feel. Despite the fact that my heart desires to be home, I know I need to be the best at my current full-time job until that door opens. Honestly I felt convicted that I’ve had a hard time at work especially with missing days unexpectedly from Kai being sick. I’ve been in and out of this rut of my heart being home, but knowing the importance and responsibility at my workplace. Then one day it hit me hard… why would God allow me to stay home if I can’t even give my due diligence in my current work situation? Am I doing a horrible job, no – but I’m just making it. Kind of like when your parents wait to see how responsible you are with your room and your chores before they consider getting you a dog or extending your curfew? Though I haven’t necessarily failed, I can’t say I’ve succeeded either. So 2014 I give you my best…all of it. It will take some serious work on my part, but though I see the end goal I don’t want to rush through the process and the lessons along the way. My heart is to be able to be a great steward of what I do have and along with that really is gratitude. We’ve fallen on some hard times through our almost three years of marriage. From job loss (both of us at different times) which turned into horrible credit, to no food in the refrigerator and even when a baby was on the way, to living in a basement because we couldn’t afford our apartment anymore. To be anything less than grateful is a slap in the face to all the blessings God has given us over the last year. So I will take care of it, no matter how I feel. Every blessing, counting them one by one. I have several more, but I hope to start off with these and expand as the year goes on.